Working commonly for transportation, entertainment, and hospitality sectors, the reservation sales agents are involved in assisting customers with their booking and appointment activities. 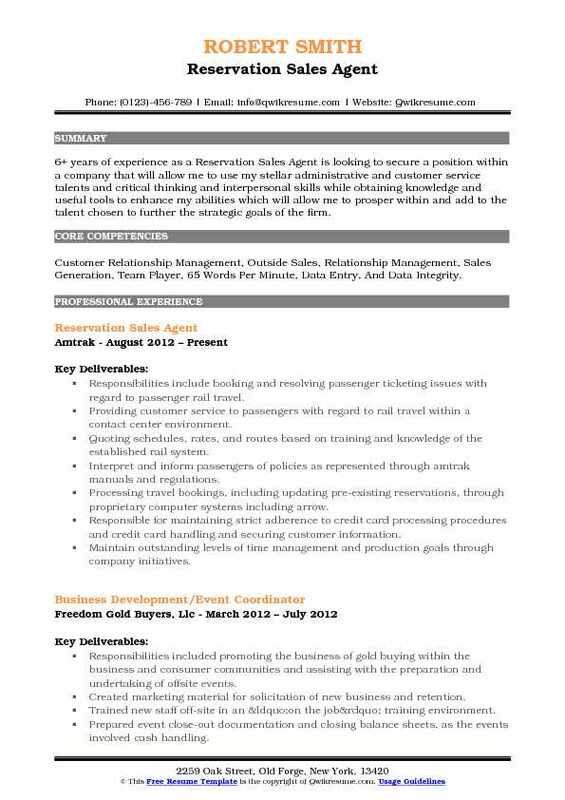 A well-drafted Reservation Sales Agent resume focuses on the following duties – assisting customers in purchasing travel tickets which may include train, air, bus or cabs helping in travel arrangements, booking for events and accommodation, booking for amusement parks or concerts, recommending alternative service, receiving calls and interacting with customers and suggesting different packages for customers. 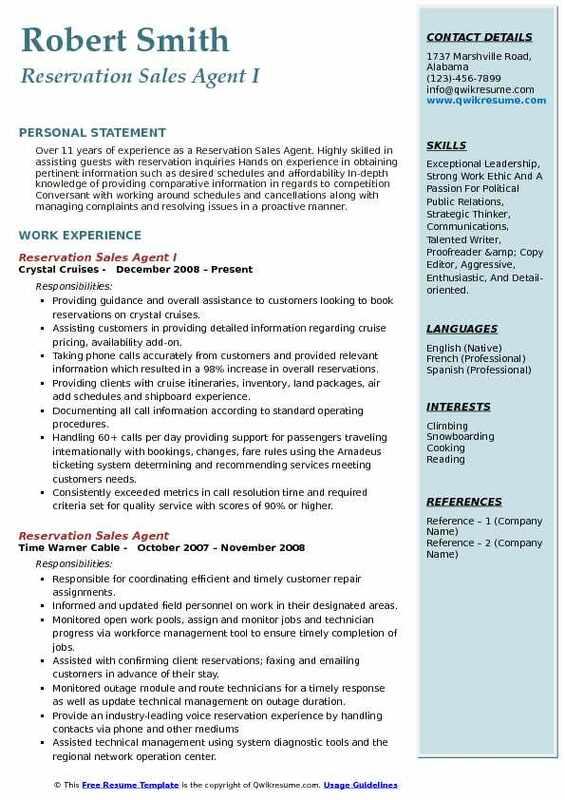 Most of the eligible resumes make mention of qualities and attributes such as communication skills, customer service skills, patience, problem-solving skills, computer competencies, ticketing and booking software proficiency, good math skills and a very good knowledge of rates, places, and job-related information. Education requirement considered essential for this post is a high school diploma. However, holding a certified ticketing course will be a great plus. Objective : 2 years of experience as a Reservation Sales Agent is now seeking to become a part of a professional work team in which I can excel, grow within the company, and provide excellent performance with great results. Skills : Microsoft Office, Adobe Photoshop, Powerpoint, Google Docs, Sales, Windows 7, Windows 8, Customer Service, Graphic Design, Inventory Management, Office Management, Administrative Assistant, And Android. Usage of Oracle opera ORS/OCIS and ops PMS systems to process reservations by mail, telephone, telex, cable, fax or central reservation systems referral. Processing reservations from the sales office, other hotel departments, and travel agents. Knows the type of rooms available as well as their location and layout, the selling status, rates, and benefits of all packages plans, also the credit policy of the hotel and how to code each reservation. Processing cancellations and modifications and promptly relay this information to the front desk. Understanding the Hotels' policy on guaranteed reservations and no-shows. Handling daily correspondence, responds to inquires and makes reservations as needed. Promotes goodwill by beings courteous, friendly, and helpful to guests, managers, and fellow employees. 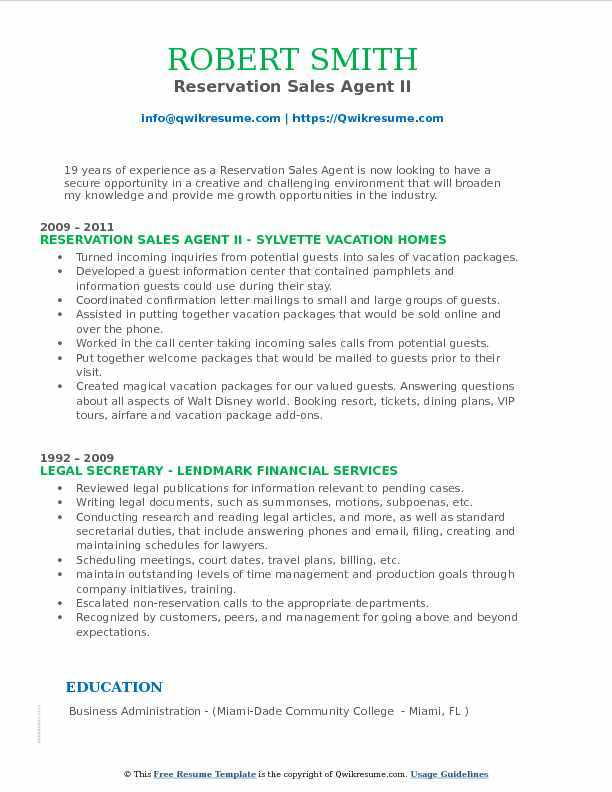 Summary : 13 years of experience as a Reservation Sales Agent is looking to secure a challenging, career-oriented position in the Travel & Tourism industry, that utilizes my Customer Service and Interpersonal Skills and offers an opportunity for future growth and development. 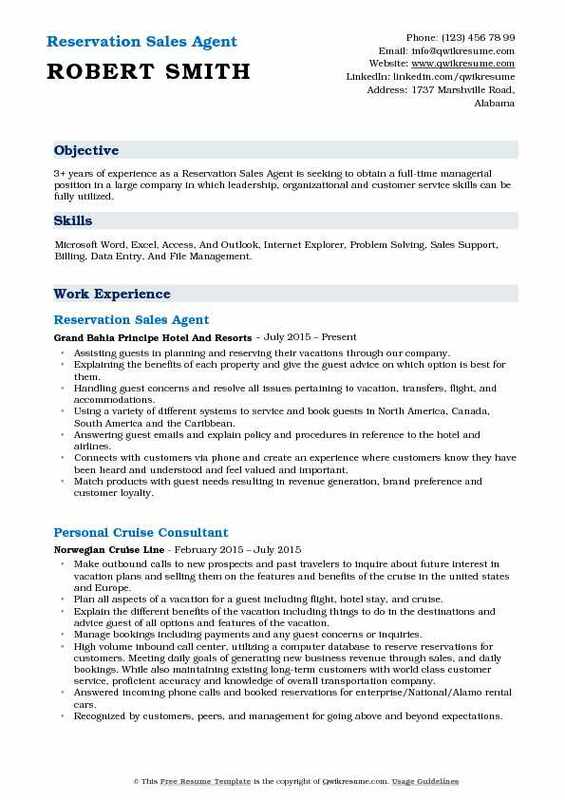 Skills : Microsoft Office, Complex File Management, Extensive Financial Review, Data Entry, Team Management, Customer Service, And Sales Generation. Sell cruises to various destinations along with optional programs such as air, land, hotel, and insurance. Service incoming phone calls in a professional, courteous and efficient manner. Consistently demonstrate a friendly and patient attitude through proper phone etiquette and positive voice inflection. Provide information to callers about Silversea ships, destinations, itineraries, and policies. Communicate cruise related requests to the appropriate department (i.e., air, hotel special services or documentation). Assist with call-out projects such as itinerary changes, missing guest information forms and canceled shore excursions as assigned by reservation supervisor and lead agents. Assist callers in resolving minor problems pertaining to new and existing reservations. Headline : I have 5+ years of proven excellence in performance as a Reservation Sales Agent and in educational support roles. An expert in customer care/communications, problem-solving, relationship building, training, and support. 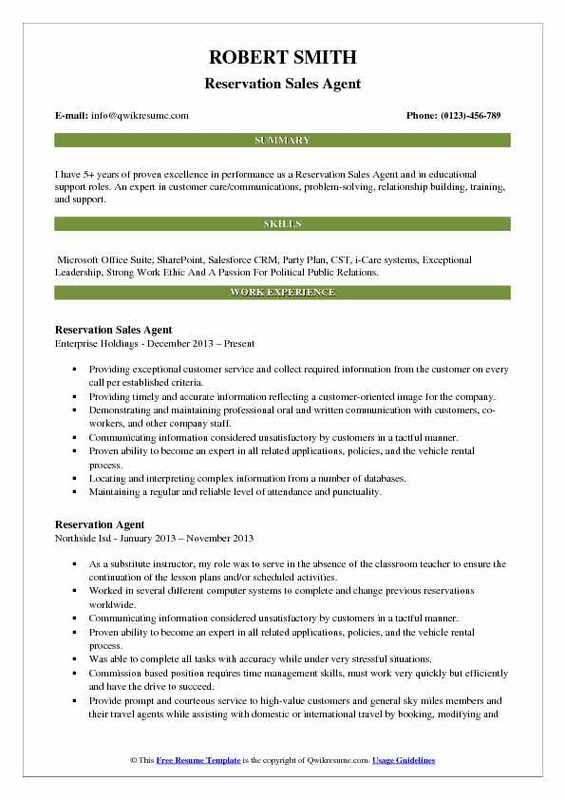 Skills : Microsoft Office Suite, SharePoint, Salesforce CRM, Party Plan, CST, i-Care systems, Exceptional Leadership, Strong Work Ethic And A Passion For Political Public Relations. Providing exceptional customer service and collect required information from the customer on every call per established criteria. Providing timely and accurate information reflecting a customer-oriented image for the company. Demonstrating and maintaining professional oral and written communication with customers, co-workers, and other company staff. Communicating information considered unsatisfactory by customers in a tactful manner. Proven ability to become an expert in all related applications, policies, and the vehicle rental process. Locating and interpreting complex information from a number of databases. Maintaining a regular and reliable level of attendance and punctuality. Headline : Experienced Reservations Sales Agent with 6+ years of experience, demonstrated the history of working in various industries. Skilled in sales travel consulting, event transportation, customer satisfaction. Skills : Dependable, Reliable, Resolution-Oriented, Excellent Communication, Attentive Listener, Customer Service, Time Management, Regulatory Compliance, Detailed-Oriented, Adaptability, Goal Attainment, And Team Leadership. Providing outstanding customer services to clients by overseeing rental agreements, selections of vehicles, and processing rental returns. Handles customer’s issues and concerns in a timely manner if any arises and confirm reservations as well make necessary changes. Processing up to 90 plus incoming calls daily in accordance with the company policy and procedure guidelines. Consistently exceeds monthly sales goal by upselling rental reservations to new and existing customers. Negotiating rental rates, advise customers of procedures, terms, and conditions of rental agreements. Composing and analyzing data reports outlining daily summaries of transaction payments, rental disbursements, and closed rental agreements. Verifying rental documentation for accuracy and completeness, including insurance, driver license, and credit card information. 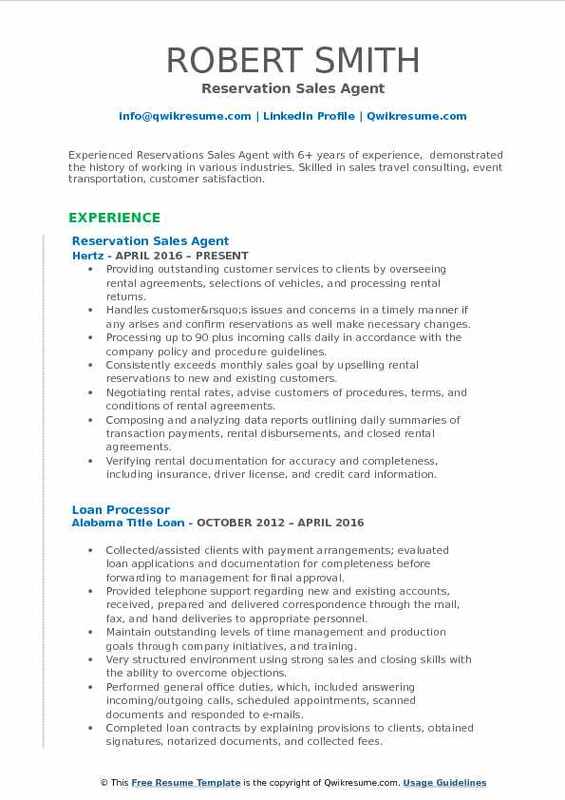 Summary : Over 11 years of experience as a Reservation Sales Agent. Highly skilled in assisting guests with reservation inquiries Hands on experience in obtaining pertinent information such as desired schedules and affordability In-depth knowledge of providing comparative information in regards to competition Conversant with working around schedules and cancellations along with managing complaints and resolving issues in a proactive manner. Skills : Exceptional Leadership, Strong Work Ethic And A Passion For Political Public Relations, Strategic Thinker, Communications, Talented Writer, Proofreader & Copy Editor, Aggressive, Enthusiastic, And Detail-oriented. Providing guidance and overall assistance to customers looking to book reservations on crystal cruises. Assisting customers in providing detailed information regarding cruise pricing, availability add-on. Taking phone calls accurately from customers and provided relevant information which resulted in a 98% increase in overall reservations. Providing clients with cruise itineraries, inventory, land packages, air add schedules and shipboard experience. Documenting all call information according to standard operating procedures. Handling 60+ calls per day providing support for passengers traveling internationally with bookings, changes, fare rules using the Amadeus ticketing system determining and recommending services meeting customers needs. Consistently exceeded metrics in call resolution time and required criteria set for quality service with scores of 90% or higher. Generated additional revenue for British Airways always offering upgrades and amenities. Received quality agent and revenue awards and customer letters of recognition. Providing first-rate customer service, assisted Spanish-language clients and strove to honor special requests. Objective : 3+ years of experience as a Reservation Sales Agent is seeking to obtain a full-time managerial position in a large company in which leadership, organizational and customer service skills can be fully utilized. 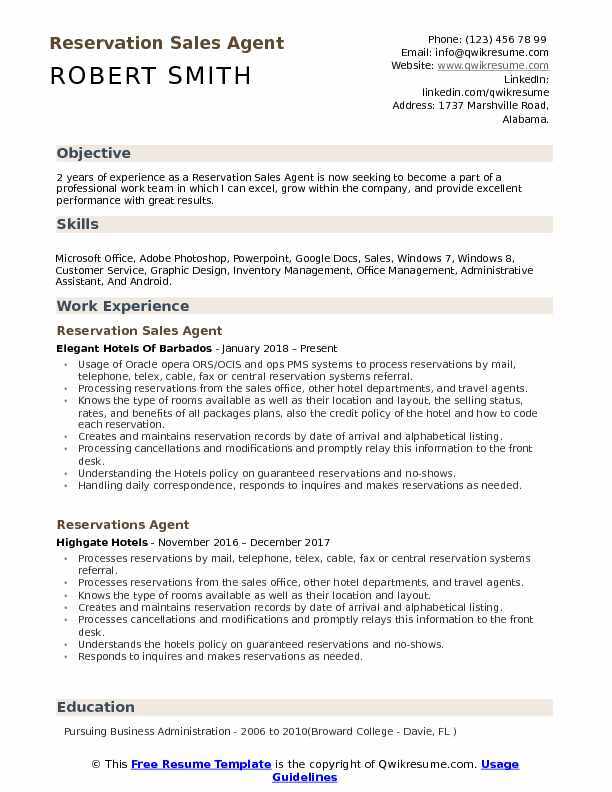 Skills : Microsoft Word, Excel, Access, And Outlook, Internet Explorer, Problem Solving, Sales Support, Billing, Data Entry, And File Management. Assisting guests in planning and reserving their vacations through our company. Explaining the benefits of each property and give the guest advice on which option is best for them. Handling guest concerns and resolve all issues pertaining to vacation, transfers, flight, and accommodations. Using a variety of different systems to service and book guests in North America, Canada, South America and the Caribbean. Answering guest emails and explain policy and procedures in reference to the hotel and airlines. Connects with customers via phone and create an experience where customers know they have been heard and understood and feel valued and important. Match products with guest needs resulting in revenue generation, brand preference and customer loyalty. Summary : 19 years of experience as a Reservation Sales Agent is now looking to have a secure opportunity in a creative and challenging environment that will broaden my knowledge and provide me growth opportunities in the industry. Skills : Microsoft Office, Training & Development, Special Event Planning, Brand Management, Customer Service, Data Entry, Data Integrity, Retail Management, MS Office, Pagemaker, Quark XPress, Oracle, And Management System Software. Turned incoming inquiries from potential guests into sales of vacation packages. Developed a guest information center that contained pamphlets and information guests could use during their stay. Coordinated confirmation letter mailings to small and large groups of guests. Assisted in putting together vacation packages that would be sold online and over the phone. Worked in the call center taking incoming sales calls from potential guests. Put together welcome packages that would be mailed to guests prior to their visit. Created magical vacation packages for our valued guests. Answering questions about all aspects of Walt Disney world. Booking resort, tickets, dining plans, VIP tours, airfare and vacation package add-ons. Assisting guest with aspects of my Disney experience to allow them to control their vacation plans. Various aspects of guest service recovery. Consistently ensure delivery of quality customer service vital to growing the Walt Disney travel company. Handling guest questions and concerns about their travel plans. Staying above threshold in all KPI categories. Headline : 6+ years of experience as a Reservation Sales Agent is looking to secure a position within a company that will allow me to use my stellar administrative and customer service talents and critical thinking and interpersonal skills while obtaining knowledge and useful tools to enhance my abilities which will allow me to prosper within and add to the talent chosen to further the strategic goals of the firm. 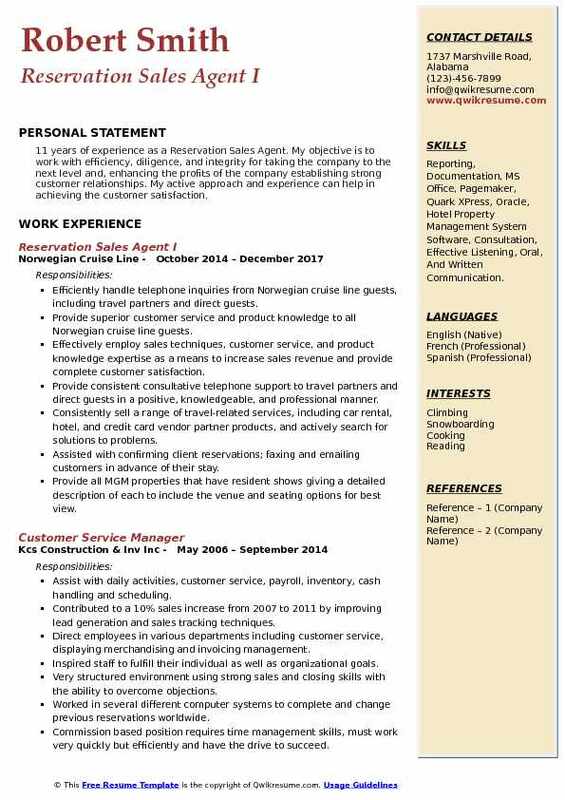 Skills : Customer Relationship Management, Outside Sales, Relationship Management, Sales Generation, Team Player, 65 Words Per Minute, Data Entry, And Data Integrity. Responsibilities include booking and resolving passenger ticketing issues with regard to passenger rail travel. Providing customer service to passengers with regard to rail travel within a contact center environment. Quoting schedules, rates, and routes based on training and knowledge of the established rail system. Interpret and inform passengers of policies as represented through amtrak manuals and regulations. Processing travel bookings, including updating pre-existing reservations, through proprietary computer systems including arrow. Responsible for maintaining strict adherence to credit card processing procedures and credit card handling and securing customer information. Maintain outstanding levels of time management and production goals through company initiatives. 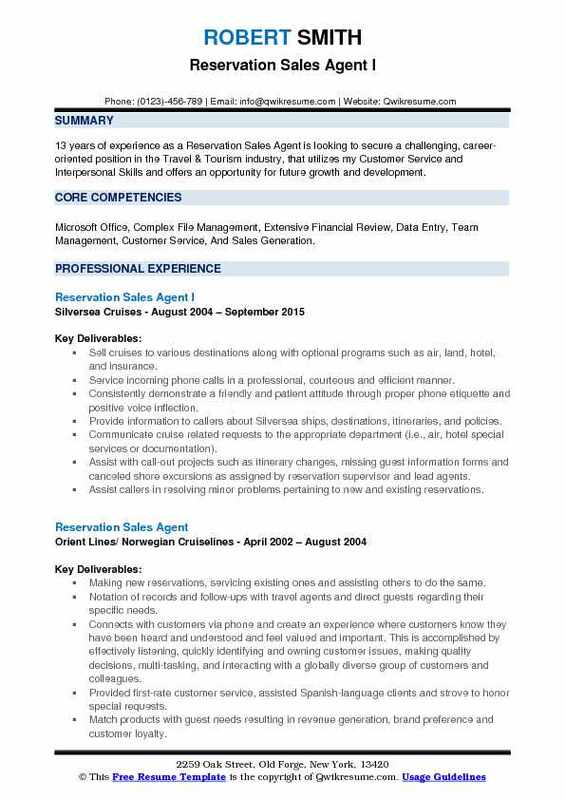 Summary : 11 years of experience as a Reservation Sales Agent. My objective is to work with efficiency, diligence, and integrity for taking the company to the next level and, enhancing the profits of the company establishing strong customer relationships. My active approach and experience can help in achieving the customer satisfaction. Skills : Reporting, Documentation, MS Office, Pagemaker, Quark XPress, Oracle, Hotel Property Management System Software, Consultation, Effective Listening, Oral, And Written Communication. Efficiently handle telephone inquiries from Norwegian cruise line guests, including travel partners and direct guests. Provide superior customer service and product knowledge to all Norwegian cruise line guests. Effectively employ sales techniques, customer service, and product knowledge expertise as a means to increase sales revenue and provide complete customer satisfaction. Provide consistent consultative telephone support to travel partners and direct guests in a positive, knowledgeable, and professional manner. Consistently sell a range of travel-related services, including car rental, hotel, and credit card vendor partner products, and actively search for solutions to problems. Assisted with confirming client reservations; faxing and emailing customers in advance of their stay. Provide all MGM properties that have resident shows giving a detailed description of each to include the venue and seating options for best view. Objective : A detail-oriented, guest service is driven employee with 2+ years of experience as a Reservation Sales Agent is seeking to obtain and expand the responsibilities of an Office Assistant by applying strong interpersonal and organization skills. 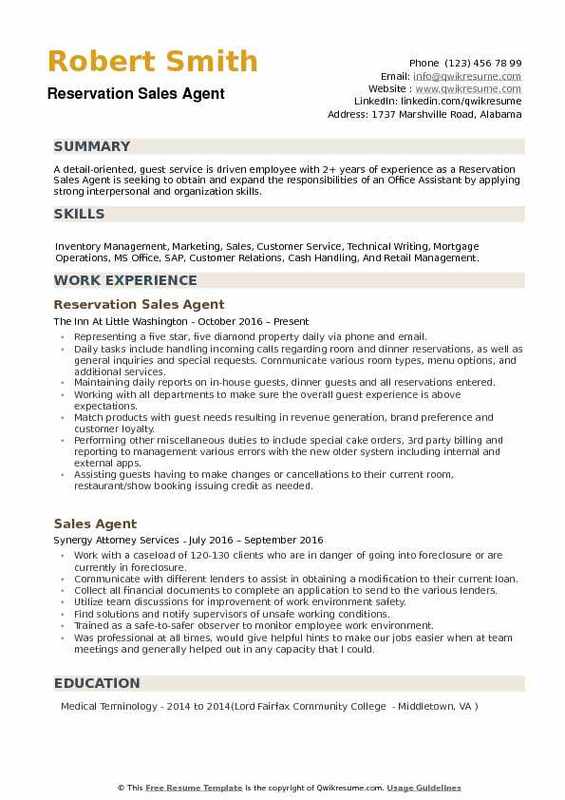 Skills : Inventory Management, Marketing, Sales, Customer Service, Technical Writing, Mortgage Operations, MS Office, SAP, Customer Relations, Cash Handling, And Retail Management. Representing a five star, five diamond property daily via phone and email. Daily tasks include handling incoming calls regarding room and dinner reservations, as well as general inquiries and special requests. Communicate various room types, menu options, and additional services. Maintaining daily reports on in-house guests, dinner guests and all reservations entered. Working with all departments to make sure the overall guest experience is above expectations. Performing other miscellaneous duties to include special cake orders, 3rd party billing and reporting to management various errors with the new older system including internal and external apps. Assisting guests having to make changes or cancellations to their current room, restaurant/show booking issuing credit as needed.